A Stradivarius Violin in Your Attic? How to Know. It would be a great shock to the world of fine stringed instruments if a lost violin from a great Italian luthier turned up. Many imitations were made 100 years ago. It is not unusual to come across a violin in someone’s attic, at a flea market or any other such corners of life where forgotten items surface. Sometimes the condition of the instrument makes it obvious that a student long ago abandoned the instrument when other pursuits just took over. Other times, the condition of the instrument or its case or something known about the owner – an eccentric uncle with some money, perhaps – lend the situation a bit of excitement. Could it be…? Is it possible…? This excitement is heightened even further when a name, presumably of its maker, is on a label or stamped inside the f-hole of the instrument, on the back plate. There it is! It says “Stradivarius”! Alas, there are many violins that were made toward the end of the Victorian era, in the late 19th century, that were falsely labeled with the names of the fabled great luthiers: Stradivari, Stainer, Guarnerius, Amati or Maggini among them. They were considered of a “student” level of quality at the time, and the ruse of their violin shops was less a lie than homage: the makers were saying the violins were made in the same style or to approximate the physical specifications of the great Italian violinmakers of the earlier era. 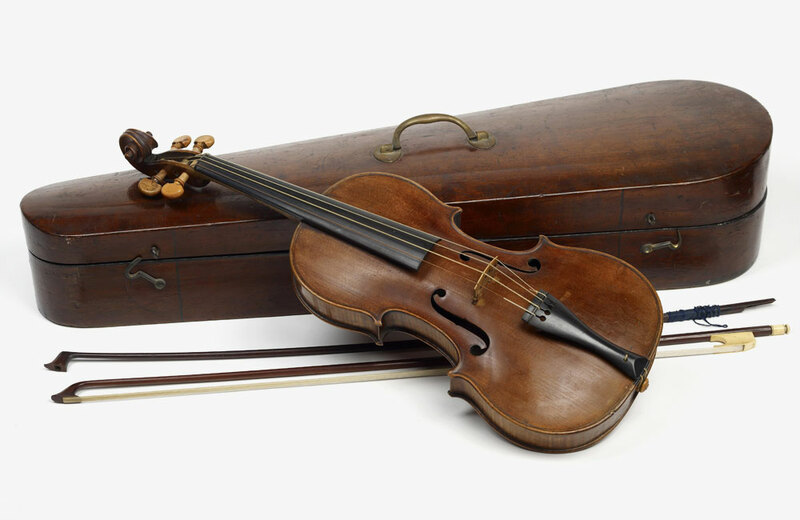 Recently, the excitement around the dollar value of antique violins (and violas and cellos) rose considerably, and raised controversy, when Chicago rare violin dealer Jeff Fushi placed the 269-year-old “Vieuxtemps” Guarneri del Gesu up for sale for $18 million in 2010. At last check it has yet to sell, but it illustrates what has happened with rare violins. Over the past 50 years, their value has appreciated 26,000 percent (compared to the Dow Jones Industrial Average, which in the same time period has risen a mere 1,400 percent). Indeed, the problem has now arisen that only millionaires and billionaires can afford them. At best, the instruments are loaned to great contemporary players, concertmasters and soloists with the world’s top orchestras. Otherwise, they are held as precious investments, perhaps seen by a rarefied group but only infrequently heard. There are less than one thousand instruments by Guarneri and Stradivari in existence, and the discovery of a lost stringed instrument found by these or other great makers would be exceedingly rare. If you find one of the 19th century imitations, expect its value to be under $1500 (with a few exceptions) and that to restore it to playable condition could easily cost as much money or more. But do not be embarrassed about asking a professional in a shop for fine violins to look at it – they are accustomed to these requests, and are responsible to all ends of the market to encourage a love of violins (and violin playing) while providing a realistic assessment and encouragement. Even the fake “Strads” were once made, sold and purchased with intent to create beautiful music.